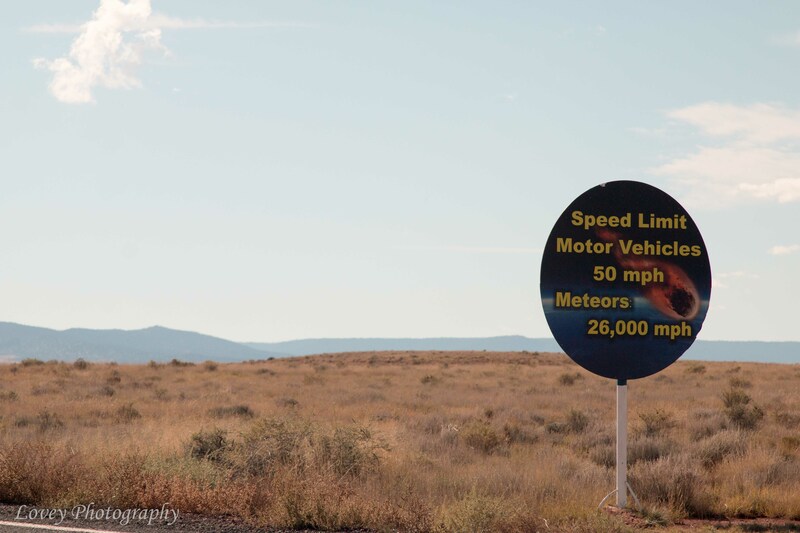 Lovey Photography – Page 2 – From May 2015 – March 2016, Sherry and Sean traveled the country and lived in a 5th wheel R.V. They took pictures, hiked mountains, and saw amazing sights. They are now settled in Fort Myers, Florida and are continuing to take pictures and seeing amazing sights. This is the blog of their journey from leaving St. Louis and starting an adventure, to living in Florida and doing photography. Enjoy the stories, and leave comments if you have one to share! 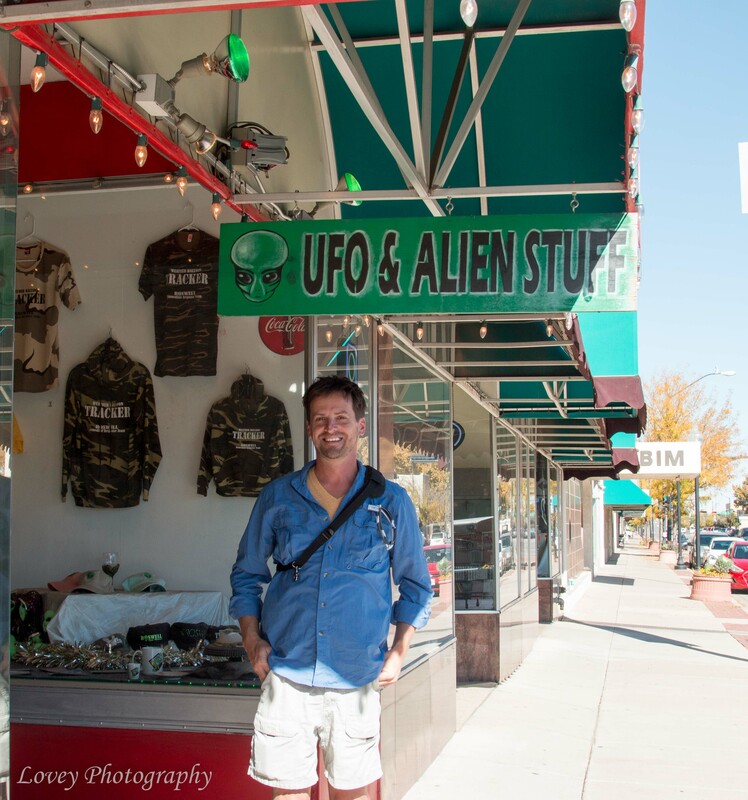 Roswell….. The Truth is Out There…. Couldn’t resist the title. Sean is a huge X-Files fan AND has wanted to see Roswell since he was a kid. It worked out great, not only were we passing nearby BUT one of Sherry’s good Theater friends, Chris, lived nearby so we could visit. Before going to Roswell, Sherry had researched places to stay and we decided on a State Park called Bottomless Lakes. The park has a series of very deep sinkholes (not quite bottomless) and full hook-ups, an added benefit. We must have hit at a very bad time of the year. The park was nice, well off the beaten path. The nearest store was a good 30 minute drive. The night skies were absolutely amazing. On clear nights it seemed like you could see every star in the sky. So why a bad time of the year? Well, nights were cool but as the day warmed up we dealt with swarms of gnats, flies and then hornets. Literally swarms of mud dauber hornets. The first day we had several burrow their way into the RV between the slide out seals. 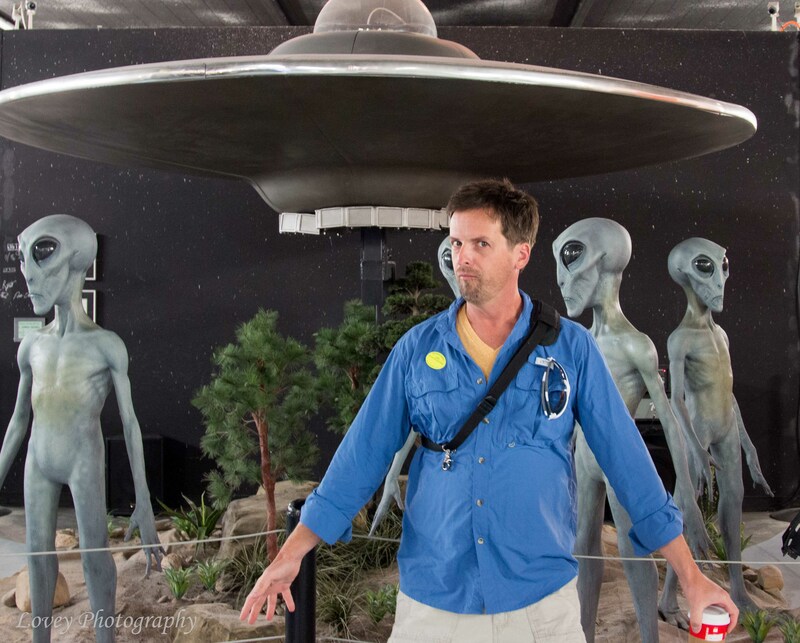 We did tour the UFO Museum and Research Center and walked downtown. Very interesting stuff. 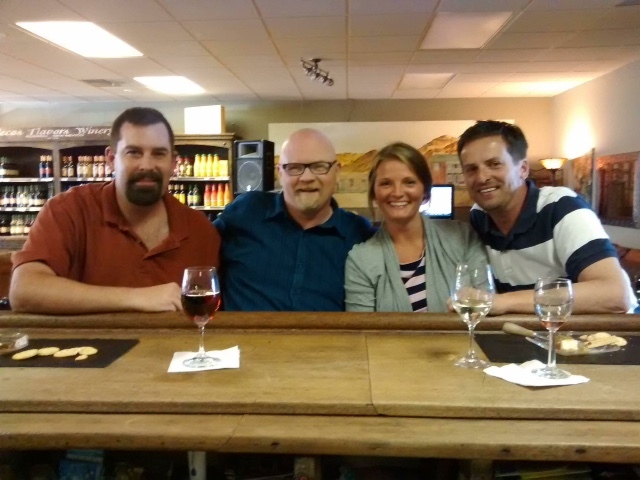 We also visited the local Winery – Pecos Flavors Winery. Sean is the ultimate science nerd. We were only staying the night, so immediately after setting up in the RV park, which was only a few miles from the site, we drove to see the crater. It was a short drive through scrub desert, nothing to see for miles but a few mountain ranges in the distance. As we approached the impact site, the terrain, which had been relatively flat, rose up to form a steep ridge. The museum and visitor center were built about halfway up the rise. Like so much of what we have seen the last few months, the sheer magnitude of what can be found in nature doesn’t become apparent until given a perspective. For us, driving up to the visitor center we were struck by how massive the huge ridge rising before us truly was… It was amazing to contemplate that huge wall was thrown up when a rock hit the earth…. 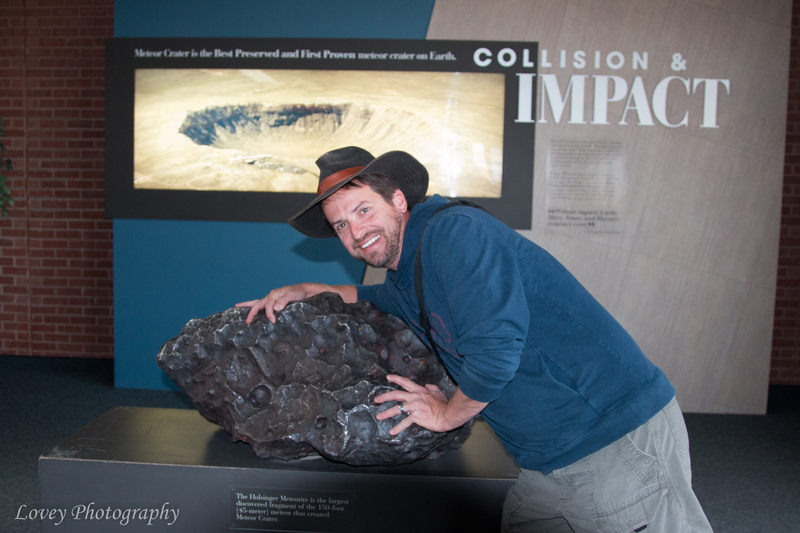 True, a big metallic rock traveling at about 40,000 MPH, but still, a rock. We took some time exploring the museum and visitor center and watched the short but informative movie that shows every 30 minutes. 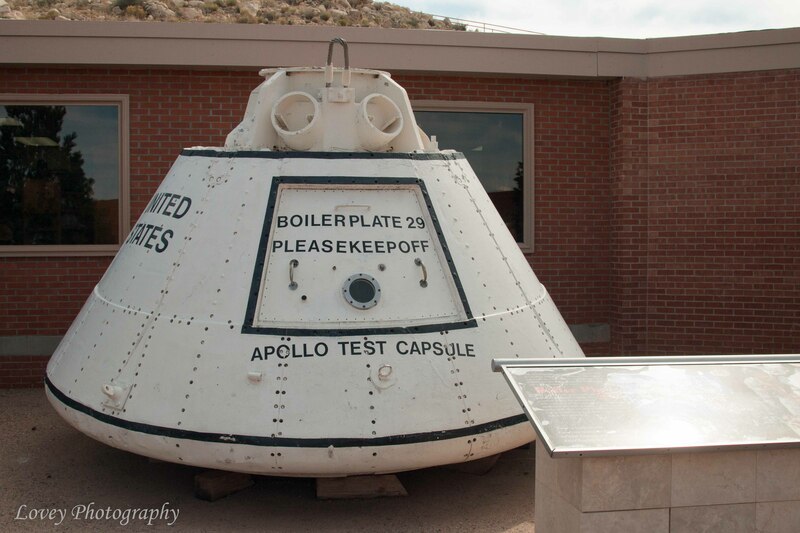 We should mention that the site is privately run and there is an admission fee to enter the visitor center. After watching the movie, we walked out to see the crater. It was a fairly steep climb to get to the top observation deck but well worth it. We snapped several photos and soaked in the view. Our next ‘Ahhhh’ moment came when we were on the mid observation deck and used the telescopes set up to show various sites on the floor and walls of the crater. One sign said there was a mine entrance on the opposite wall, we couldn’t pick it out until we looked through the telescope or our zoom lens on the camera. Another telescope was aimed at a 6 foot silhouette of an astronaut standing near an American flag at the center of the crater. Again, almost too small to see with the unaided eye. We soaked in the views before returning to our RV and capturing some amazing desert sunset photos. Can you see the astronaut sillohuette? Can you see the mine entrance? Leaving Winslow, we continued our journey, the next stop being Albuquerque, NM. We had hoped to stay for several days, but had to adjust plans on the fly. Sean had been in ABQ several years before for a conference. 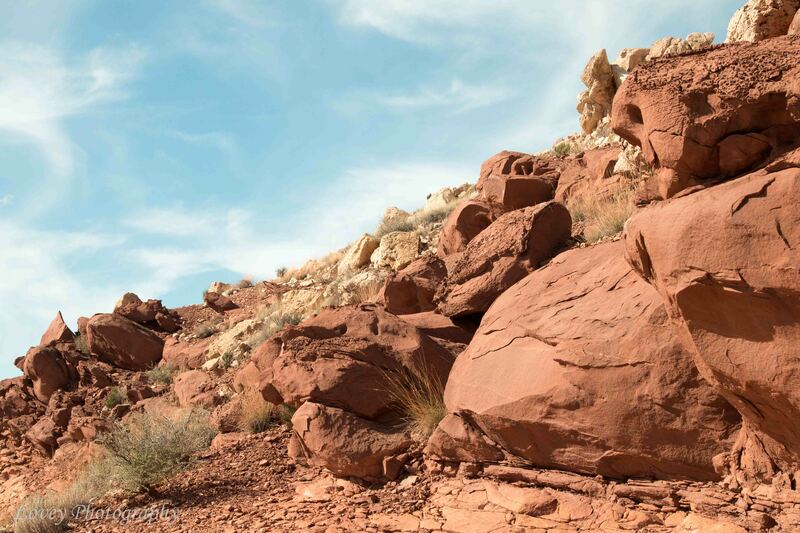 He loved the city and in his spare time explored places, but wanted to spend more time viewing the petroglyphs and a few other sites. Since our plans changed, we only had a day and decided to go to the ABQ Botanical Gardens. Sherry had read about it and we thought it would make an interesting stop. We spent a day wandering the gardens and the adjacent aquarium. The gardens had a number of surprises for us. Seriously, Sean pretended he didn’t know her….. Here are a few samples from that visit. Sean really enjoyed the waterfall shots and playing with camera settings to smooth out the falls or capture each drop. These images have been heavily edited to enhance that effect. Loved the jellyfish display. Great opportunity to play with camera settings. Sean swims with these things! Waterfall capture. We enjoyed the falls and then editing the images for different looks. Gorgeous rose gardens… Sherry said she had never heard the song, ‘I never promised you….’ Maybe it was just Sean’s singing? You can also access the reviews on the main page of the blog through a link on the right hand side of the page. We made this video a few weeks ago while staying in Williams, AZ. The weather had been getting chilly and it was the perfect time for baking. Plus, we were planning a hike at the Grand Canyon and Sean’s Oatmeal/Craisin Muffins would be perfect as a hikers snack. We have been all over New Mexico the last few weeks and will do a text blog in a few days. 🙂 As always, we appreciate your comments. Enjoy the video. If you want the recipe, just send us a message. This second video has been posted a while but we never did a blog about it. If you are a hiker/camper you should definitely check out the JetBoil.